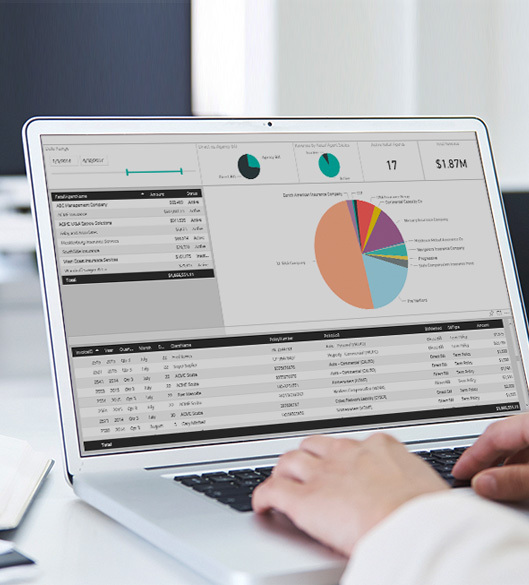 Gain insights, knowledge, and intelligence from end-to-end reporting and analytics to optimally manage your business. Always be informed and know your business in detail so you can make the best possible decisions today, and be prepared for the challenges tomorrow. The XD Insurance Processing Platform is constantly capturing data across the breath of your transactions, data entry, partner activity, and automation, providing the most sophisticated and complete relational data set available today. Benefit from the full breath of financial, accounting, operational, departmental and compliance reports (Bordereau), as well as advanced reports for measuring, evaluating, and implementing changes. View virtually any report on the fly, such as loss ratios, retail agent commissions, carrier commissions and sales pipeline. Add unique views of your data and truly hone in on your operations. By leveraging performance assessment tools, you can evaluate employee, distribution partner, and client workloads. See who’s really making an impact favorably and unfavorably on profitability, time, and resources. Determine roadblocks, then institute corrective actions, add incentives, set performance goals, and monitor. With real-time alerts, notifications, and dashboards you’ll stay informed and up-to-date. We’ll help your organization be proactive, keep ahead of the workload, and remain keenly focused on priorities driving the desired business outcomes.